Remington has been shaping the shooting world for more than 200 years. Due to its long line of iconic firearms, Remington has become one of the most recognized and respected names in the industry. The company brings the same innovation, quality, and performance to their Express Core-Lokt ammunition. With unmatched, on-game reliability, Core-Lokt ammo offers precision performance from point-blank to 500 yards. Each factory fresh cartridge is loaded with a 150 grain pointed soft point Core-Lokt projectile. The tapered copper jacket of these proprietary bullets is locked to a solid lead core. The result is massive expansion (up to twice the original diameter) and near 95 percent weight retention. These bullets also feature a pointed Spitzer profile for improved velocity and flatter trajectory. Providing hard-hitting terminal energy and massive tissue damage, these effective loads also deliver impressive accuracy. 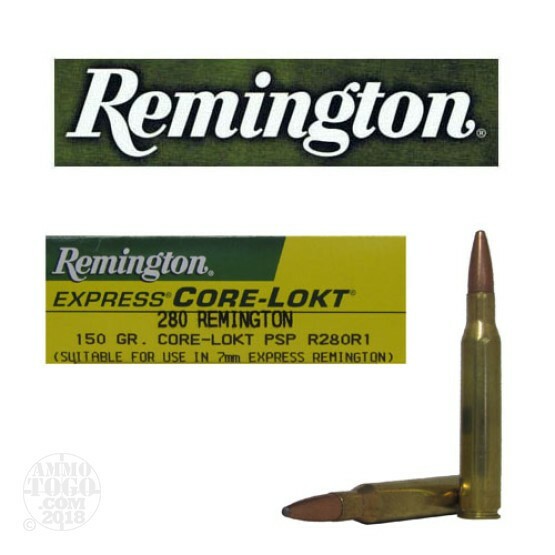 This Remington Express .280 Remington ammunition is well-suited for taking most North American game animals, and a good portion of Africa’s plains game. This ammunition is non-corrosive, boxer primed, and features high-quality reloadable brass cases. Each round produces a consistent velocity of 2781 feet per second and a muzzle energy of 2890 foot pounds. Each package contains 20 rounds.